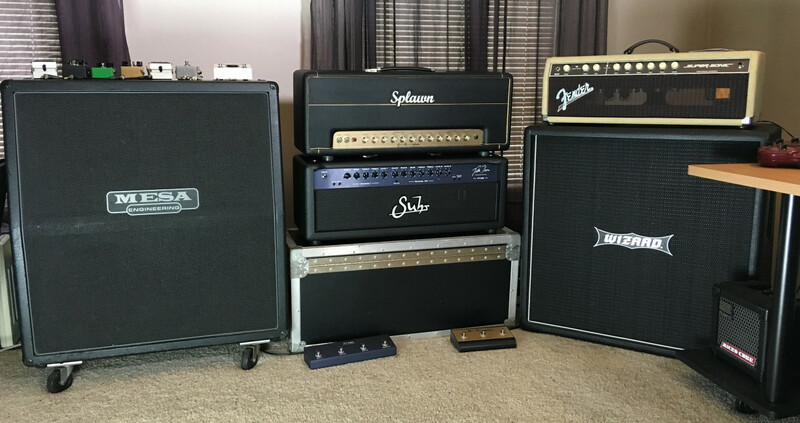 So, what amps do you own? These are listed in order of my preference to use. Last edited by jnoel64 on Tue Sep 05, 2017 9:36 am, edited 1 time in total. I've owned a buttload of amps over the years - including 20 boutique or modded amps at one time just a few years ago. 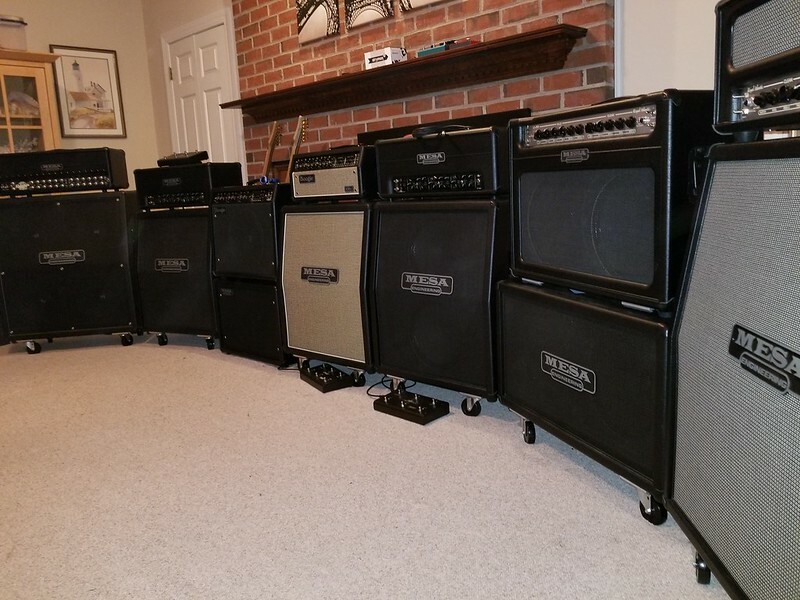 But there's no way to play that many amps and really enjoy them, so I started paring down. I profiled them all, sold 'em, and now I'm happy owning a single tube amp. Mark III black dot DRGX. I got it as a blonde/tan combo but made a Peruvian Walnut/curly maple headshell for it. Not a real fan of combos. Studio .22, rebuilt, now in blue snakeskin tolex with an EVM-12L. Custom amp still being made for me. 2 custom built (by me for me) ported 1x12s with EVM-12Ls. Sound compared to Mesa Thiele cabinet: Better bass, better focus and definition. Obviously I'm a bit short on speaker cabinets, given how many amps I have. Mark III black dot currently in a head shell I made for it. Peruvian walnut with a very intensely flamed curly maple front. 1979 silverface Fender Pro Reverb, one of the (to some people) infamous ultralinear transformer models that doesn't have a good natural overdrive sound. Well, that is true, but its clean tone is fantastic in spades. This is nearly a museum quality example, very close to dead mint shape. 1982 Fender Super Twin Reverb, the infamous beast. 180 watts of F___ YOU EARDRUMS!!! Currently under restoration, I just got it very recently and tonight I got the amp back up and running after a full recap job and some other maintenance items. The cabinet is in ratted out shape and needs a full restoration (which I'm doing) but the chassis, other than being full of puked capacitors, is in nearly untouched condition. When restoration is complete it'll be among the finest examples of the type. And not worth much despite that. They're just not very collectible. But boy will they ever play loud! I've been seriously tempted to totally rebuild this amp as a Mark IIC+ hiding in a Fender chassis. Since it has a 5 band EQ (rotary knobs instead of sliders) and its center frequencies can be adjusted to match Mesa EQ center frequencies, it could be made to become a Mark IIC+ in hiding without a lot of compromises. Undecided on that. Thinking hard about it. Actually planning out the conversion. It won't be quick or simple to execute. Guild Hartke GH412A angle front 4x12 with Celestion G12P80 speakers. Not awesome but for the 100 bucks I paid for it, it is! 2 custom 1x12 cabinets of my own design with EVM-12Ls. Better bottom end and tighter focus than the Mesa version. Not sure If I have posted in here before, but an update is definitely due. I definitely do have a preference for combos. Yes I want to destroy my back. Avatar Standard 2x12 loaded with Eminence Texas Heat 16 speakers. Currently, the one thing I am probably doing is selling off some of the Carvins, and the Marshall. Maybe will look into changing speakers around.